Simon & Schuster, 9781476716954, 336pp. The astonishing untold story of the people who transformed sports, in the span of a single generation, from a job that required top athletes to work in the off-season to make ends meet into a massive global business. In the cash-soaked world of contemporary sports, where every season brings news of higher salaries, endorsement deals, and television contracts, it is mind-boggling to remember that as recently as the 1970s elite athletes earned so little money that many were forced to work second jobs in the off-season. Roger Staubach, for example, made only $25,000 in his first season as the starting quarterback for the Dallas Cowboys and wound up selling commercial real estate during the summer. Today, when Fortune reports that every athlete on its Top 50 list makes more than twenty million dollar per year, it’s clear that a complete reversal of power has occurred right before our eyes. Players is the first book to tell the astonishing narrative behind the creation of the modern sports business—a true revolution that moved athletes from the bottom of the financial pyramid to the top. It started in 1960, when a young Cleveland lawyer named Mark McCormack convinced a young golfer named Arnold Palmer to sign with him. McCormack simply believed that the best athletes had more commercial value than they realized—and he was right. Before long, he raised Palmer’s annual off-the-course income from $5,000 to $500,000 and forever changed the landscape of the sports world. In Players, veteran Wall Street Journal sports reporter Matthew Futterman introduces a wide-ranging cast of characters to tell the story of the athletes, agents, TV executives, and league officials who together created the dominating and multifaceted sports industry we know today. Beginning with Palmer and McCormack’s historic partnership, Players features details of the landmark moments of sports that have never been revealed before, including how legendary Wide World of Sports producer Roone Arledge realized that the way to win viewers was to blend sports and human drama; the 1973 Wimbledon boycott, when eighty-one of the top tennis players in the world protested the suspension of Nikola Pilic; and baseball pitcher Catfish Hunter’s battle to become MLB’s first free agent. 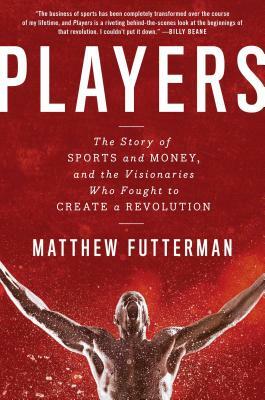 Players is a gripping, fly-on-the-wall account of the creation and rise of the modern sports world and the people who fought to make it happen. From the professionalization of the Olympics to the outsize influence of companies like IMG, Nike, and ESPN, this fascinating book details the wild evolution of sports into the extravaganza we experience today, and the inevitable trade-offs those changes have wrought. Matthew Futterman is a senior special writer for sports with The Wall Street Journal. He has previously worked for The Philadelphia Inquirer and the Star-Ledger of New Jersey, where he was a part of the team that won the Pulitzer Prize for Breaking News in 2005. He lives in New York with his wife and children. Players: The Story of Sports and Money, and the Visionaries Who Fought to Create a Revolution is his first book.